I've been thinking about beetroot a lot lately. Weird, eh? I don't really know why, but suddenly I browse my cookbooks for beetroot recipes and make lists of various beetroot recipes to try. I've already posted plenty of beetroot recipes on this blog: beetroot & goat's cheese sandwiches, beetroot & garlic salad, beetroot & feta salad, filo tartlets with beetroot and three types of cheese. Yet I still long for more, and there are so many delicious-looking beetroot recipes out there in the blogosphere that I simply have to try: Anne's beet risotto with fava beans, Bea's beetroot ravioli and beetroot tabouli and dark chocolate and beetroot brownies (there's a foodblogger to my heart! ), Alanna's wholegrain bread with beetroot, Clivia's beetroot cake with saffron glaze. I could go on and on.. 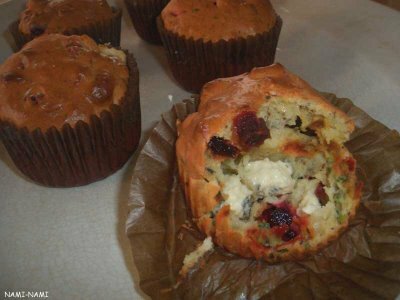 In any case, I baked these savoury muffins with beetroot and blue cheese last weekend. On Sunday, K. and I headed to the forests and bogs again to gather wild mushrooms (we got loads!) and pick cranberries (I've got enough for some 10 cakes now). These muffins were ideal when we re-emerged from the forest - exhausted, dirty, wet, yet happy and content - three hours later. A lovely combination of moist'n'sweet beetroot and salty'n'tangy blue cheese. Mix flour, baking powder and basil in a bowl, add blue cheese and beetroot. Stir gently. Mix cream, eggs and oil in a jug and stir quickly into the batter. Pour into lined muffin cases and bake at 200C for 18-20 minutes. They're best eaten warm, but are also great for lunchboxes. If you want, put into a microwave for 20 seconds to heat through. hey - go easy on the beetroot - it does funny thing to your insides! ;-) Tell us more about the mushroom foraging - what types are you getting most of and how do you make sure you're getting sfe ones..? ma kohe ei teagi, kas nüüd kui sa eestimaal, kirjutada siin eesti või inglise keeles? minule hakkas peet eelmisel kevadel meeldima, et panin kohe kaks pakki seemneid aeda maha. ja isegi täitsa palju peete sain. ja need peedi lehed, kui ilusat värvi need on. True true, you and I share the same love for beets! Yum! I have to make note of your recipe. Another beet one, super! Everydaychef - nice to 'see' you here after a long silence! Beetroot has never disagreed with my system, so I'll just keep eating it:) As for mushrooms, I'll post a picture of my mushroom crop soon. My bf and his mum are very good in telling a safe mushroom from one that's not, and I just take their word on it. Maarja - mõlemad on lubatud:) Kas Sa peedilehtedest ka midagi teed? Ma seni pole miskit teinud, aga väidetavalt võib neid käsitleda sarnaselt spinatile. Bea - I'll be cooking my way through your beetroot repertoire soon, hopefully starting with ravioli - these were gorgeous! peedilehti ma pole proovinud söögitegemiseks. lihtsalt nende värv lummab mind. thanks for your great recipe. We had a red, white, and blue breakfast today to celebrate July 4. I made your muffins & everyone loved them Would have made the brie, strawberry & blueberry bites if I had read your blog in time. thanks so much for such fun!